Every snowman needs a top hat. 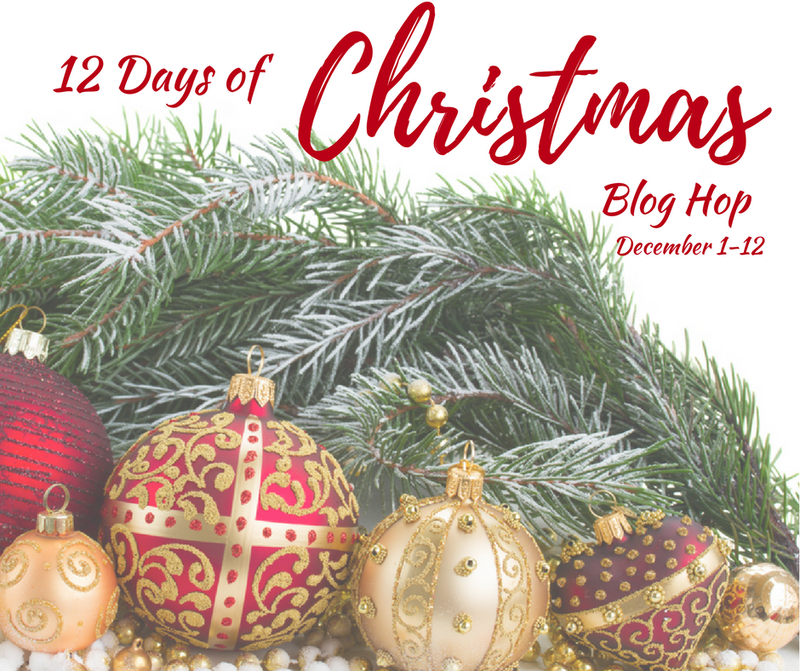 As part of the 12 Days of Christmas Blog Hop day three has a theme of snowman. A snowman without a top hat would not be complete. 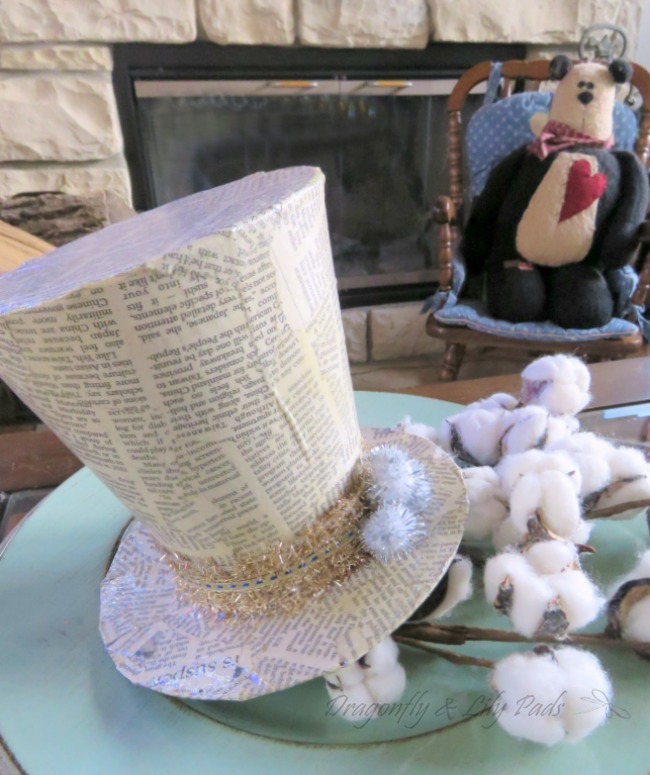 This quick easy Mod Podge tutorial will have you creating the perfect top hat for your best dressed snowman decor. Follow along with the many creative makers during the blog hop to be inspired by this talented group of bloggers. Tear the newspaper into pieces including the edges. You should use text. No pictures to get this look. Using the chip brush dip it into the antique Mod Podge painting it onto the paper hat shape. 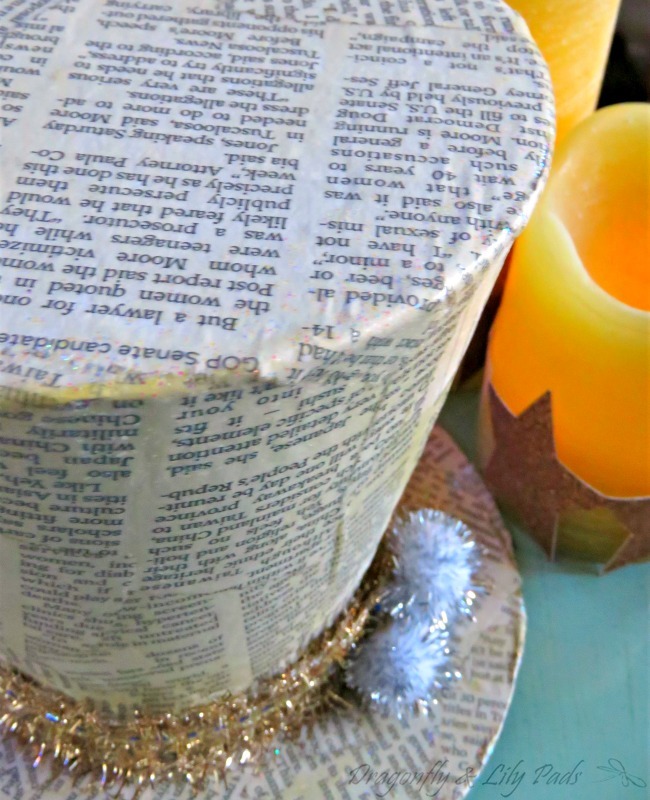 As you add more paper covering the whole top hat you will continue to add more Mod Podge layering more paper to the edge of where you just finished. Similar to keeping a wet edge when you are painting. 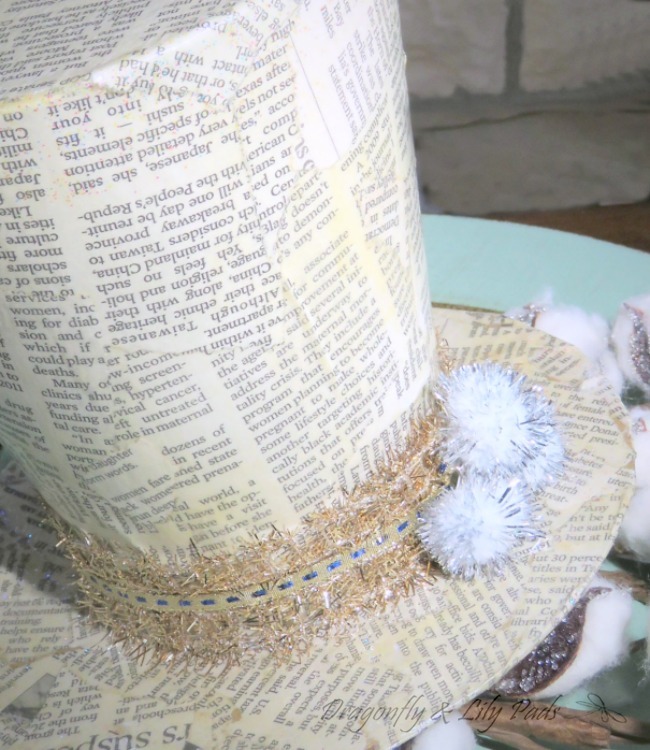 Give your whole top hat a coat of Mod Podge to seal the project. It will also give you and antique or yellowing look to your newspaper. Let it dry over night. The next morning measure by wrapping the wider ribbon around the hat cut. Tacky Glue worked great to hold it in place. The thin ribbon added a little more glamour to the top hat which is easy to attach by tying it in a not after following the same process to cut the length needed. Pom poms seemed like the perfect way to finish the decoration with added sparkle. Let it dry then add to your Christmas decorating in your home. 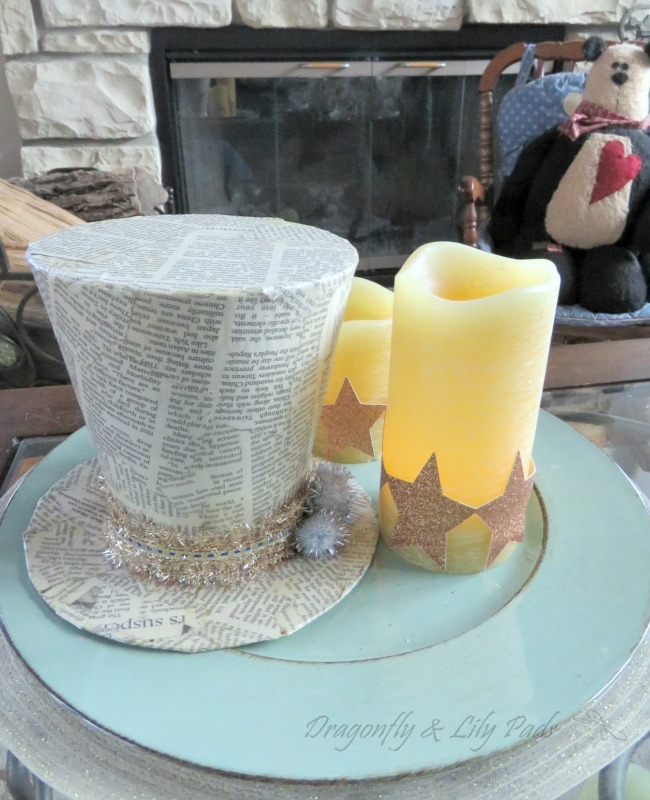 Below is a few examples of how I styled small vignettes with my DIY winter glam decor top hat. By tipping the hat with the cotton peaking out below the top hat gives this simple glamour inspired top hat a whole new feel. Finally I was able to catch a photo with a glistening a bit of glam. Since you 💖DIY Winter Glam Decor here is a perfect pin to save it to your Holiday or Winter Boards. Question of the day- What is your favorite Frosty The Snowman Show? I love your top hat! I made one very similar years ago from a quick oats container and I used it as a tree topper!! What a great top hat. I love the printed paper and the glam trim. It is gorgeous! What a fun hat, I love it! A classy frosty!